How Post tax benefits of Debt Mutual Funds beats Fixed Deposits? Have you ever thought that you might be losing your hard money by locking it in fixed deposits? Instead of multiplying your money, fixed deposits might be eating-up your money. Baffled!!! Let?s see how fixed deposits are not a good investment avenue as most of us thinks. Most of the Institutions that are authorized by RBI to provide Fixed Deposits facilities such as banks, NBFCs, Companies, Housing Finance Companies etc. offer fixed deposits with interest rate ranging from 8.50% to 9.50% for tenure of 1 year. The interest may vary for longer term but usually lies in between the above ambit. Interest Rate: 8.50% p.a. to 9.50% p.a. Inflation rate indicates the rise in the prices from the base price. Let?s say the product you could have bought for Rs.100 few years back, would cost you Rs.107.5 at present i.e. 7.00% costlier. This inflation rate when combines with the tax rate depletes your return tremendously even to the negative figure. 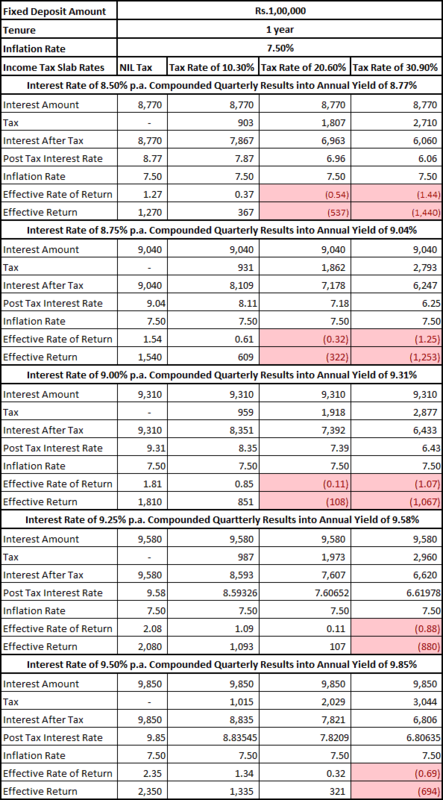 As you can see from the highlighted cells shows the negative returns in terms of rates as well as amount. What we say from the above calculation is that people falls in the tax bracket of 20% and above losses their money when parked in fixed deposits. While fixed deposits seems to give moderate returns to the people falls in the lowest tax bracket of 10%. Debt Mutual Funds are one of the best alternatives of fixed deposits. Both debt fund and fixed deposits falls in the category of debt investments and the return from the debt funds is similar to fixed deposits. Rate of Return 7 % p.a. to 12% p.a. 7% p.a. to 10% p.a. Interest Rate MFs are linked to market and thus returns are variable. The rate of return is fixed for entire tenure. Flexibility Any amount can be invested or any amount can be redeemed any time from the existing debt fund. Once the amount is invested in fixed deposits, no addition can be made. New FD is to be created for additional amount. Liquidity Redemption can be made at any time but if made within 1 year, the exit load of 1% may be levied. Once the amount is invested in fixed deposits, the premature withdrawn is permissible only after penalty of 1%. Underlying Assets State and Central Government Bonds, treasury bills, corporate NCDs etc. N.A. Pre-Tax Return of fixed deposits and debt mutual funds are almost similar but post-tax returns have material differences. This is because returns from fixed deposits are taxed as per tax slabs of the investor while returns from debt mutual funds are taxed as capital gains or tax slabs. If the investment horizon is of less than 3 years, then the return from debt mutual funds are termed as short-term capital gain and taxed as per the slab of investor, similar to fixed deposits but if the investment horizon is of 3 years or more than the actual tax benefit of debt mutual fund can be achieved by combing tax rate with indexation. The table below gives you the complete understanding of the taxation of debt mutual funds and fixed deposits. Another tax benefit of opting debt mutual funds over fixed deposits is the deferment of tax. In case of Fixed Deposits, investor has to include the tax in the income every year and pay taxes while in case of debt mutual funds, if no redemption is done, no income is generated therefore no tax becomes payable, this means tax will be payable only when the units of mutual funds are sold. Investors falls in the 30% tax bracket is at the loosing spree by investing in Fixed Deposits irrespective of the interest rate, they should look for the other investment avenue such as debt mutual funds, tax free bonds etc. For investor falls in the tax slab of 20%, both debt mutual fund and fixed deposits are equally good if the return is at least 9.25% p.a. Lastly, for the investor falls in the lowest tax bracket of 10%, the fixed deposits scores above any other investment avenue. What do you by 10 percent, 20 Percent,30 percent tax bracket ?? Yes you are right but there are other options for earning higher interest and also to keep capital safe. One such option is tax-free bonds. But its better than keeping money idle in savings account, right? You want to say that people in 20% or higher tax slab should invest in MF rather than in FD, right? Very useful information. Thanks a lot! !